This painting, whilst in its subject matter, composition and style characteristic of Olsen’s work, is also radically different from his other seascapes. This is because Olsen seems preternaturally alive to the changing conditions of weather, light and time of day, and able to play with the basic elements of his pictures (five-eighths sky, three-eighths sea, sailing ships) to produce an extraordinarily varied output. There are few artists of such restricted themes whose work could be hung all together and continually astonish by the versatility of its mood, colouring and effect. 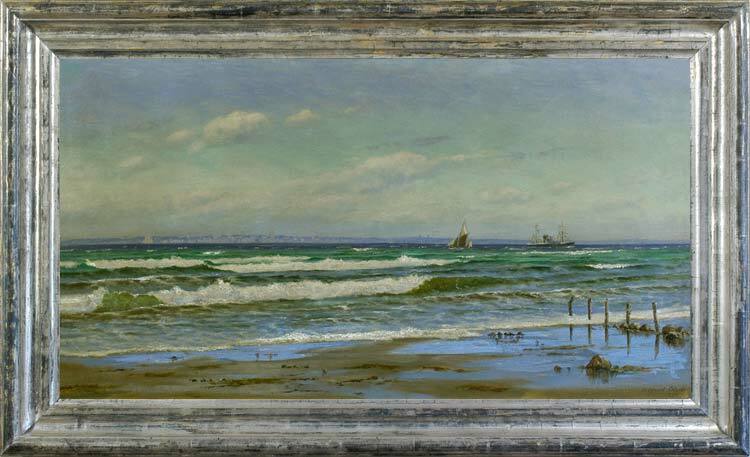 Very little is known about Alfred Olsen, save that he was born in Fejo in Denmark in 1854; that he studied with Jens Jorgen Jensen-Egeberg (1848-1922); and that he made a living as a painter of marines in Copenhagen (Benezit). Jensen-Egeberg taught at the Royal Academy of Art in Copenhagen; he produced landscapes which were the equivalent of Olsen’s seascapes, where the Scandinavian sky, full of light and high cloud, filled the greater part of the painting. Olsen’s work seems only peripherally to admit the existence of the land, but his skies show that he had absorbed much from the teacher who was only six years his elder. The absence of public record of his work and of the artist himself is a testimony, as with so many ‘neglected’ artists, to a great popularity at a domestic level, such that these works tend to stay in the homes which appreciate them and do not often emerge onto the market.